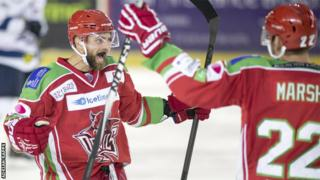 Cardiff Devils fought back to beat Dundee Stars 3-2 at the Big Blue Tent on Saturday, the first of two wins at the weekend. The home team trailed after Doug Clarkson's early strike, before the Devils replied through Tomas Kurka and Guillaume Doucet. Mikael Lidhammar tied the game for the Stars in the third period, but Brent Walton won it for the Welsh side four minutes from time. Andrew Lord's side made it back-to-back wins on Sunday by beating Edinburgh Capitals 4-0.